Posted in Diet & Nutrition on November 5, 2013 by NebraskaHealth.com staff. Last modified on April 06, 2018. Read disclaimer. If we want to have a healthier community, a healthier nation, a healthier world, we've got to start with our kids. And it all begins with nutrients. If you want to build a tall building (we're going to say that this is like your body), you've got to start with a good foundation. And that foundation includes eating nutritiously. We need to have good nutrients which means we need to be eating the healthy foods that can help us lay down that foundation. Children ages 2 to 12 need to have five servings of fruits and vegetables per day -- in fact, according to the US Dept. 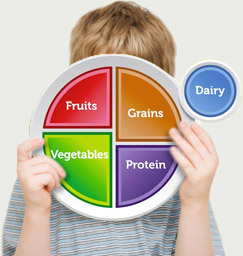 of Agriculture's MyPlate recommendations, these should account for half of the child's daily food consumption (see image at right). As boys enter puberty, they need to be eating nine servings of fruits and vegetables per day. As girls enter puberty, they need about seven servings of fruits and vegetables per day. NebraskaHealth.com is a participant in the Amazon Services LLC Associates Program, an affiliate advertising program designed to provide a means for sites to earn advertising fees by advertising and linking to amazon.com. If the fruits and vegetables are from all the different colors of the rainbow, they're going to provide different kinds of nutrients. And those different kinds of nutrients -- vitamins, minerals, polyphenols, proteins, fats, water, fiber, etc. -- now become a part of the child and help that child build new cells. Children should be eating 2-3 ounces of fiber-rich, whole grain foods (cooked grains, whole-grain pasta, bread or cereal) daily. Protein should come primarily from lean meats, fish, beans, nuts, eggs and low-fat milk products. Children need nutrients to build good brain cells, to build a good immune system, to build healthy skin. If you're missing a nutrient at a critical moment, it's like missing a piece of steel in the foundation of a building. That building is never going to be as robust as it could be if it had all the steel at the right time. If you have all the nutrients at the right time, you build a healthier child. Keep nutritious foods, drinks and snacks more readily available in the home and avoid buying foods with empty calories. For instance, offer fresh fruit, smoothies, homemade low-sugar oatmeal with raisin cookies, popcorn lightly salted and drizzled with olive oil, dry-low sugar cereal with milk, or homemade frozen fruit bars rather than packaged snacks. Limit the frequency and serving size of treats by breaking bars in half, diluting juices with seltzer water, serving smaller bowls of cereal (that are "stretched" by adding fresh fruit) and smaller cups of sodas. Treats should be views as treats -- not staples or meal substitutes. If you DO eat fast food, shun super-sized portions. When shopping with kids, avoid aisles with sweetened foods, snacks and drinks. Never use sweets as rewards, bribes or comfort-foods since this can create an emotional attachment with sugary treats. Get creative in the kitchen. Involve children in meal preparation and try to make meal time fun. Make it a practice of eating food in the dining room or kitchen only -- discouraging kids from eating snacks out of boredom in front of the TV or computer. Encourage children to drink water or milk rather than sugary beverages. As a family, eat grilled, steamed or broiled foods more often, limiting consumption of fried foods. Be a good role model. And make certain that the other adults in their life (grandparents, baby sitters, day care providers) set good examples, as well. Be patient. Children may need consistent, frequent exposure to healthy foods before they'll accept them. Talk to your kids about resisting the pressure to make unhealthy choices that may come from friends, TV commercials and other advertising. When you see your child making unhealthy choices, explain why those foods or actions must be limited or avoided. And compliment them when you see them making healthy choices. Stress the importance of eating a healthy breakfast! Research shows that children and teens who skip breakfast are at increased risk of becoming overweight or obese. The average childrens' diet today is often lacking in the nutrients kids need. But if we want our children to be healthy, we must teach them well, exemplify proper behaviors and give them the nutrients they need to build a healthy foundation for their future. To learn more, visit the US Dept. of Agriculture's Information Center for Child Nutrition. Of course, diet is only one factor in helping our kids grow safe, healthy and happy. The CDC provided a wonderful list of parenting ABCs. Honolulu, Hawaii: Foods rich in nutrients called flavonoids (particularly a specific type called anthocyanins) may help protect against Parkinson's disease, it was reported at the American Academy of Neurology's annual meeting. Anthocyanins are found in berries and other red and purple fruits and vegetables. Researchers studied data on over 49,000 men who were part of the Health Professionals Follow-up Study and more than 80,000 women from the Nurses' Health Study. Using diet questionnaires, scientists calculated the amount of flavonoids people consumed. Over a 22-year period, men who consumed the most flavonoids were 40% less likely to have Parkinson's than those who ate the least flavonoids. And while this study found no correlation between women's risk of Parkinson's and flavonoid consumption in general, the anthocyanins class of flavonoids DID appear to offer protective properties for both men and women against the development of Parkinson's disease. Atlanta, Georgia: In an alarming new study, researchers discovered that strokes have increased 30% or more in young people. Scientists from the U.S. Centers for Disease Control and Prevention (CDC) studied ischemic stroke hospitalization data from 1995 to 2008. 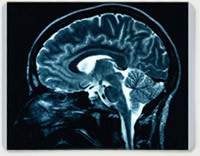 (Ischemic stroke occurs when blood clots block or plug a blood vessel in the brain. Over 80% of all strokes are ischemic.) CDC researchers found that ischemic stroke rates were 30-37% higher among those aged 15-44. Broken down by gender, ischemic stroke risk rose 50% for men 35 to 44; 46% for men 15 to 34; 29% for women 35 to 44; and 23% for women 15 to 34. In the same time period, traditional stroke risk factors such as high blood pressure, cholesterol problems, diabetes, tobacco use and obesity have also been on the increase. Research Triangle Park, North Carolina: U.S. states spend anywhere between $200 million (Wyoming) and $15 billion (California) each year in medical expenses related to obesity, say researchers at RTI International, Duke University and the federal Agency for Healthcare Research and Quality (AHRQ). The study was published online in Obesity. "This study shows that the toll that obesity takes goes beyond impairing the health of the individuals to imposing a major burden on the entire health care system," said Carolyn M. Clancy, MD., AHRQ director, in a press release. "Reducing the prevalence of obesity and its complications is an important priority for the nation and requires focused and constant attention." Researchers also found that 25-64% of state-level obesity costs are financed through Medicare and Medicaid. Figures confirm that obesity is a large, preventable part of the country's medical costs. Hisayama, Japan: According to researchers at Kyushu University in Japan, diabetes significantly increases one's risk of developing dementia and Alzheimer's disease. Scientists used data from the long-term Hisayama Study to determine the link. In 1988, over 1,000 participants took a glucose tolerance test. Over the next 15 years, 232 of them developed dementia. Researchers found that those who had been diagnosed with diabetes had a 74% increased risk of some type of dementia compared to those with normal glucose tolerance. Those with glucose levels that could be termed as pre-diabetes were 35% more likely to develop dementia than those with normal glucose tolerance. 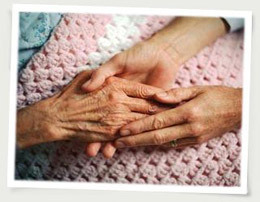 Alzheimer's was the most common type of dementia diagnosed in the study. Those diagnosed with diabetes were 50% more likely to get Alzheimer's than those with normal glucose levels. Comment at How to cook with dried beans from Willy: "You could mention that lentils and split peas are exceptions to..."
Comment at Making fitness fun from booker: "Phone apps may be motivating for some but I still prefer seeing..."
Comment at Sun safety tips from Tamara: "My father was recently treated for precancerous spots on his face..."
What are the nutritional needs of children? Why are food allergies becoming so common?